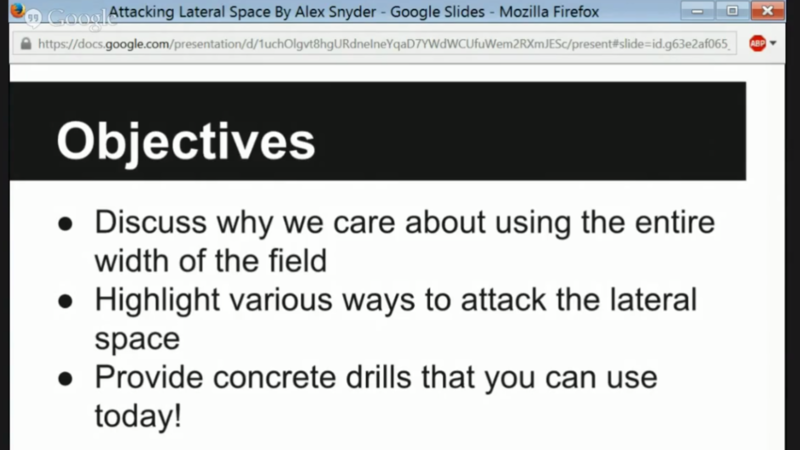 This post is a review of Alex Snyder's 2014 URCA presentation, Dumps, Swings, Breaks: Attacking Lateral Space & Using the Field's Width. You can see the full presentation by becoming a member of our URCA Classroom. We all know the feeling of being trapped on the downwind sideline. Who hasn’t experienced the frustration of watching your teammates turn it on the endzone line by trying to squeeze it into the corner instead of swinging the disc? How can you cut better to help your teammates get the disc off the sideline? What does attacking space laterally look like in a horizontal stack? In this presentation, Alex Snyder shows us how to do all of the above. Learn some tricks and tips useful for handlers and cutters alike. Alex also diagrams drills you can run to help your team with more effective disc movement. Basic reset cut that attacks lateral space. How to attack lateral space in a horizontal stack. Plus a handler weave drill to you can do with your team. Offense is easier when you have more space. When you get near the endzone, you run out of vertical space. Continue the momentum of the disc. Run dump resets almost every single practice. The reset must sprint to get in position early for the best opportunities to attack lateral space. Does committing your hips to the reset make things easier or more difficult? Do you turn your hips to the reset? How does your team communicate to activate the reset cut? See Alex Snyder's full presentation here in our URCA Classroom. You'll learn two more drills you can do with your team. Learn how to deal with a sideline trap situation. Get a more in depth explanation of how to be opportunistic and how to continue the momentum of the disc.